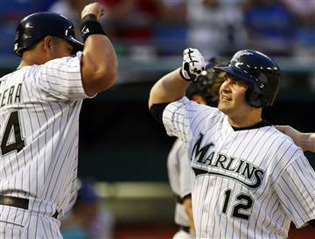 The Closer: Freakin' Marlins ... ! • 1. Ask Not For Whom The Anibal Tolls. It tolls for thee, NL wild-card hopefuls. The Marlins will not go away, as our Gamefish Overlords demonstrated on Monday by treating the Mets like Sonny Corleone at the toll booth, 16-5. Cody Ross hit three home runs, and Anibal Sanchez — he of the no-hitter in his previous start — tossed a mere four-hitter over seven innings for Florida. And now it is time to say "Dan Uggla." Thank you. • 2. Hurt So Good, Sometimes You Know It Hurt So Good. Frank Thomas hit a home run for the sixth consecutive game, which is just nuts, by the way, but the Twins, they shall not be denied. Carlos Silva went seven innings for the win, Michael Cuddyer had four ribbies as Minnesota beat Oakland 9-4. The Conjoined Cities moved within 1 1/2 games of the idle Tigers in the AL Central. • 3. Robinson Cano On Mars. Randy Johnson got career win No, 280 and Robinson Cano doubled in three runs in the seventh, but the big news is Derek Jeter got two hits to extend his hitting streak to 21 games. Yankees 9, Orioles 6. Or, if you're a Baltimore fan, the big news is that Fernando Tatis seems incapable of playing left field; Cano's double in the seventh really should have been set to music. • 4. Where's Tony Danza When You Need Him? Meanwhile, the Vanilla Foot Coverings remained 1 1/2 games behind the Twins in the wild-card race, Chicago taking a 3-2 win over the Angels behind winning pitcher Jose Contreras. • 5. Plenty Of Hard Cheese, Hold The Onions. Hey, remember Zach Duke? He struck out seven to lead the Pirates over the Brewers 4-3, on Monday, and also won the Sausage Race.